Jacqueline has a thing or two to say about Vivienne’s late night study sessions on Chapter 10, Page 21. 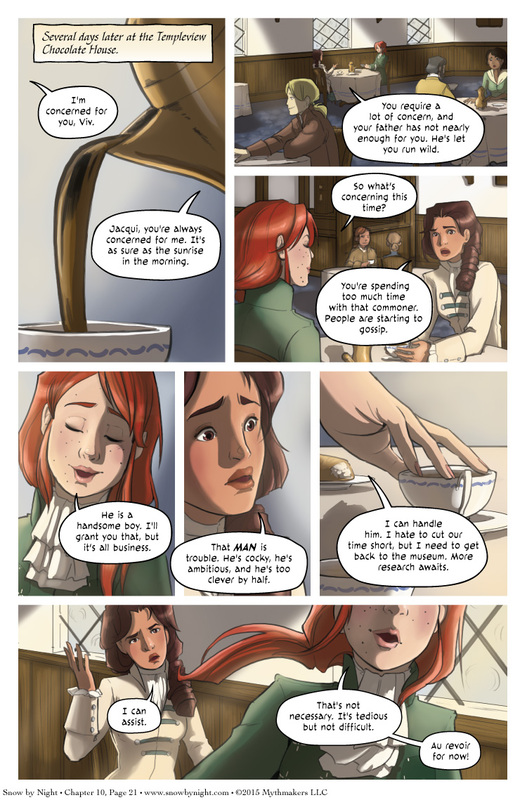 Vivienne dismisses her warnings which doesn’t sit well with Jacqi. I’ve titled the next page “When Jacqi Met Mathilde”. See a preview for yourself when you vote for Snow by Night on Top Web Comics. In cast you didn’t see, we launched our Kickstarter campaign for Volume 2 of Snow by Night. We’re already 25% of the way there. When we hit $2,500, we get another update with Paws. Tell your friends. Give us your support. We need you to make this possible. Nothing like dancing the horizontal tango to take one’s mind off one’s troubles. Clearly Viv likes her meat well done. Cienian’s advice must be looking increasingly tempting for Jacqueline right about now. I’ve always thought ‘adieu’ was meant more as a final farewell than as a see-you-later. Does it have a different cultural meaning here? I’m far from an expert on Canadian French. And leave it to Vivienne to reduce such a long term, weighted term into TTYL! A dieu doesn’t really mean “Until we meet again in heaven”, it rather means “May God watch over you”, which is fitting for a short term just als well as for a long term or a final farewell. I went and checked the etymology. Adieu was a contraction of “Je vous recommande à Dieu” which translates to “I recommend you to God”. Its first appearance in a grammar reference was in the late 12th century, where it was noted as being a phrase used to take one’s leave of somebody. FYI, Nic is my language specialist. Whenever I have a French question, I ask him. Their hometown of Québec was one of the inspirations for Snow by Night. Interesting. Thanks for the insight! I’ve always loved the français mixed into the dialogue in this comic.